Amos Alonzo Stagg was an end on the first All-America team selected in 1889 and he was elected to both the charter class of the College Football Hall of Fame (1951) and the charter class of the Basketball Hall of Fame in 1959. He is considered to be one of the great innovators in college football. Some of his innovations included the tackling dummy, the huddle, and the reverse. He served as head football coach at University of Chicago from 1892 to 1932. During his tenure, Stagg compiled a record of 242-112-27 and led the Maroons to seven Big Ten Conference championships (1899, 1905, 1907, 1908, 1913, 1922, and 1924). He was elected to both the charter class of the College Football Hall of Fame (1951) and the charter class of the Basketball Hall of Fame in 1959. On September 16, 1960, Stagg, then 98 years old, announced his retirement while serving as coach of the Stockton Junior College football team. After 70 years of coaching football, track, baseball, and basketball Stagg's career was unparalleled. On August 16, 1862, Amos Alonzo Stagg was born in West Orange, New Jersey. He was the fifth of eight children born to Amos Lindsley and Eunice Pierson Stagg. His mother died when he was young and his father carved out a living supporting the family as a shoemaker. At the time of Stagg’s birth, Abraham Lincoln was President of the United States and the country was embroiled in the Civil War. Stagg was seven years old when Rutgers University and Princeton University met in the first intercollegiate game of football played in the United States. After graduating from Orange High School in 1883, Stagg attended Phillips Exeter Academy in order to prepare himself academically for Yale. Influenced by his sister, his Sunday school teacher, and his minister at the First Presbyterian Church of Orange, New Jersey, Stagg chose to attend Yale because it had a divinity school. He entered Yale University in the fall of 1884. In the spring of 1885, he tried out for the baseball team and was soon promoted to the varsity as a third baseman, not as a pitcher where he had starred as a high school player and at Phillips Exeter. Stagg was moved to the mound after Yale’s star pitcher was moved to catcher. In his five years on the mound (athletes at that time could play varsity athletics while in graduate school), Stagg pitched Yale to five conference championships and, after his senior season, was offered $4,200 to play for the New York Nationals. He refused the offer because of his strong belief in amateurism, a belief that would be a part of his makeup throughout his professional career as a coach. In 1887, his junior year, he started playing college football and by 1889 he was selected to Walter Camp’s first All-American football team as an end. Stagg became the first paid football coach at Williston Seminary, a secondary school, in 1890. He would coach there one day a week while also coaching full time at the Springfield, Massachusetts, YMCA, now Springfield College. Stagg organized the school’s first football team, and among his players was James Naismith, the inventor of basketball. On March 11, 1892, Stagg, still an instructor at the YMCA School, played in the first public game of basketball at the Springfield (Mass.) YMCA. A crowd of 200 watched as the student team crushed the faculty, 5-1. Stagg scored the only basket for the losing side. He moved on to coach at the University of Chicago (1892-1932). William Rainey Harper, Stagg’s divinity professor at Yale, was appointed the first president of the University of Chicago and in 1892 named Stagg head football coach and director of the department of physical culture. Under Stagg’s guidance, Chicago emerged as one of the nation’s most formidable football powers during the first quarter of the twentieth century. In addition to his football duties, Stagg coached track for 32 years, baseball for 19 years, and basketball for one season. He helped to organize the Big Ten Conference (then known as the Western Conference) and was one of the founders of the American Football Coaches Association (AFCA). He was a member of the U.S. Olympic Committee for six Olympiads. He coached America’s 400 and 800 meter athletes, as well as its 1800 meter relay team, in the 1924 Olympic games in Paris. He served as chairman of the NCAA track and field championships for 12 years. He became the coach at College of the Pacific at the age of 70 and stayed in that position from 1932 to 1946. From 1947 to 1952 he served as a co-head coach with his son at Susquehanna University in Pennsylvania. He became known as the "grand old man" of college football. He was the first college coach to win 100 football games and the first to win 200 games. He was the second coach in college history to win 300 games when he won number 300 on November 6, 1943, against St. Mary’s of California at age 81. His overall record as an NCAA head football coach was 314-199-35. He was the first person inducted into the College Football Hall of Fame as a both a player and as a coach. He helped organize the original Football Rules Committee in 1904 and was the Committee’s only lifetime member. Among the innovations credited to Stagg are the tackling dummy, the huddle, the reverse and man in motion plays, the lateral pass, uniform numbers, and awarding varsity letters. A self-described stoic, Stagg was a divinity student in college, but decided his weak voice and quiet manner were not conducive to pursuing a career in the ministry. He was a staunch Presbyterian who saw coaching sports as the perfect place for him to provide a moral education for young men. The Yale mission to the "Bowery of New Haven" was founded by Stagg while a student in the Yale Divinity School. Stagg regarded the coaching profession as "one of the noblest and perhaps the most far-reaching in building up the manhood of our country" and "a fine chance to do Christian work." His religious beliefs went deeper than most; for Stagg, being "spiritually ready" was as essential for the successful athlete as physical preparedness. In 1900 Stagg wrote a letter to his 14-month-old son that read in part, "Your father wants you to detest evil. No curiosity, no conversation, no story, no reading which suggests impurity of life is worthy of your thought and I beg you never to yield for an instant but turn your attention to something good and helpful. Never use liquors, tobacco, nor profane language." In his final years Stagg turned down a lucrative Hollywood offer to base a movie on his life. Robin Lester in his book Stagg's University wrote, "It is probable that he personified, for many Americans, a purer, less materialistic, Christian America that had been lost." He died in 1965 at the age of 102. He was elected to the College Football Hall of Fame as both a player and a coach in the charter class of 1951 and was the only individual honored in both areas until the 1990s. Influential in other sports, he developed basketball as a five-player sport and was elected to the Basketball Hall of Fame in its first group of inductees in 1959. In 1952, Barbara Stagg, Amos' granddaughter, started coaching the high school girls basketball team for Slatington High School in Slatington, Pennsylvania. Two high schools in the United States - one in Palos Hills, Illinois, and the other in Stockton, California - and an elementary school in Chicago, Illinois, are named after him. The NCAA Division III national football championship game, played in Salem, Virginia, is named after him. The athletic stadium at Springfield College is named Stagg Field. The football field at Susquehanna University is named Amos Alonzo Stagg Field in honor of both Stagg Sr. and Jr. And he was the namesake of the University of Chicago's old Stagg Field where, on December 2, 1942, a team of Manhattan Project scientists led by Enrico Fermi created the world's first controlled, self-sustaining nuclear chain reaction under the west stands of the abandoned stadium, as well as Stagg Memorial Stadium, Pacific's football and soccer stadium. Phillips Exeter Academy also has a field named for him and a statue. A field in West Orange, New Jersey on Saint Cloud Avenue also bears his name. The Amos Alonzo Stagg Award is given to the "individual, group or institution whose services have been outstanding in the advancement of the best interests of football." Its purpose is "to perpetuate the example and influence of Amos Alonzo Stagg." The plaque given to each recipient is a replica of the one given to Stagg at the 1939 AFCA Convention. ↑ 1.0 1.1 1.2 Ron Newsome, Amos Alonzo Stagg: Just Who Was This Guy, Anyway? ncaa.com. Retrieved December 7, 2009. ↑ Joseph Fagan, West Orange's most forgotten son Westorangehistory.com. Retrieved December 7, 2009. ↑ 3.0 3.1 University of Chicago Bio Athletics.uchicago.edu. Retrieved December 7, 2009. ↑ 4.0 4.1 Amos Alonzo Stagg Award Afca.com. Retrieved December 7, 2009. ↑ Legends of the Fall: Saint Amos. Magazine.uchicago.edu. Retrieved December 7, 2009. ↑ John Underwood, 1962. A Young Father's Letter To His Son Sportsillustrated.cnn.com. Retrieved December 7, 2009. ↑ Stagg Field Westorange.org. Retrieved December 7, 2009. ↑ Alonzo Stagg 50-mile hike Learningtogetalong.blogspot.com. Retrieved December 7, 2009. Amos Alonzo Stagg profile Athletics.uchicago.edu. Amos Alonzo Stagg and Football at Chicago Encyclopedia.chicagohistory.org. Basketball Hall of Fame Hoophall.com. Amos Alonzo Stagg Photo archives Images.library.yale.edu. Stagg Honored on 95th Birthday Archive.org. Physical Culture and Athletics Lib.uchicago.edu. 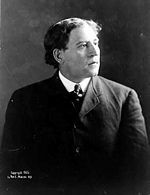 History of "Amos Alonzo Stagg"
This page was last modified on 16 March 2016, at 16:48.